The Prestige BE2028 has a redesigned valve block and a fully adjustable microball main tuning slide trigger. 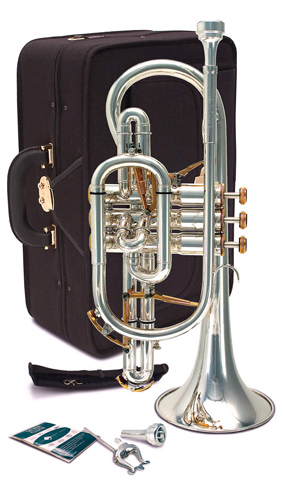 It posseses many of the playing characteristics of the old 921s and original International cornets so loved in the 70s. This is the premium Instrument of choice for top soloists and band members. Since joining the Buffet Crampon group in 2006, new tooling has been implemented and laser measuring of past models has taken place. This reference to older models such as Imperial, New Standard and early Sovereign is to ensure the original designs and ethos of the Besson sound are accurately respected and represented. Bells are hand hammered and hand spun, as was the case prior to the early 90s. This method avoids over tensioning the metal and ultimately produces more sonorous instruments. Each valve is individually hand lapped and perfectly fitted. .470 Large Bore, Silver Plate, Main Tuning Slide and 3rd Valve Triggers, Top centre sprung Monel Valves, Main tuning slide and 3rd slide trigger gold plated, top and bottom caps gold plated, luxurios case supplied.